He Didn’t Know It Was His Father! Part of my growing up years was in the village before I moved to the city. Life in the village was sometimes hard but there was a lot of fun too. Farm work was never easy but that was not all there was to it. We kids used to play around and have a lot of exciting things to do when we were not busy. I know that the moment those who grew up in the cities hear of the dirty looking children in the villages, they feel very fortunate and think everyone over there is suffering and about to die. But that is not always correct! Of course there is poverty in the villages and a lot of people live in utter depravity of basic needs. Those who are better furnished should always think of helping those in the villages who are suffering and dying needlessly. But believe me, there is life in the village too. I mean people over there do have ways of enjoying their lives way beyond what those in the cities can imagine. At least, that was my experience. I won’t ever forget this! I remember this day, I and my friends (all of us in our early teens) were out playing in the moon light. At that point in time, the moon was yet to come to its full brightness so it was little dark but it was bright enough for us to play around. Then not too far away from where we were playing, someone pointed his touch light at one of us. The touch light was so bright it was blinding to look straight into it. He focussed the touch light right onto the face of one of our playmates. This colleague of mine started to rail abuses on the one pointing the light at him. He said “Who do you think you are? You are stupid; you are an idiot, just wait for me, I am going to deal with you today, I am going to finish you …..” etc. And he matched forward like an angry soldier straight towards the one pointing the light at him. And when he got very close to him, the person switched off his touch light and lo and behold, it was his father! My friend screamed and ran away as fast as his legs could carry him! You’ve got to understand, at that time, children were raised to honour and respect their parents. When your father is correcting or rebuking you, you bow your head in humble submission and take correction.You don’t answer back talk less of insulting your father like it is these days especially in the so called “civilized world”! Oh well, at that time, nobody had corrupted us with the philosophy of “social correctness” whereby correcting your child is now called child abuse. So my friend screamed and ran because he couldn’t imagine speaking to his father that way even though he was totally unaware that the light pointer was his father. When I see the way some people cast the things relating to God behind their backs, I often think of that incidence. Do they realize whom they are snubbing, rejecting, insulting, blaspheming and ridiculing? For multitudes of people, as long as they can get on with their lives, God is totally irrelevant and their godless life styles bear witness to that. At least, that is the way the majority here in London live and a lot of Americans and several millions around the world are also catching up on that too. What will such people do the day they find out that the One they scorned and rejected; blasphemed and abused and did not want to associate with all their lifetime, is actually the originator and the owner of the life in them and the very breath in their nostrils? And believe me, a day like that is coming. Who told you there is no God? A lot of people these days have convinced themselves that there is no God and for many others, they don’t want to even think about Him or have anything to do with Him, if at all He exists. Thanks to Mr Charles Darwin and his cohorts, many of them do not believe they were created by God. As far as they are concerned, they are the product of evolution, which was a product of the big bang, which was a product of the fusion of some particles and atoms, which came out of nowhere! And many find that more believable and acceptable than what the Bible has to say about the One who created all things! My friend, don’t let anyone deceive you, this world did not just happen and neither did you or your ancestors. God made all things. 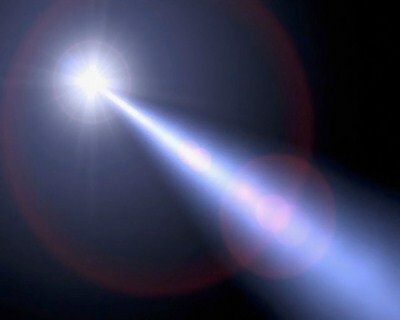 Do you realize that the “Light Pointer” is your heavenly Father? God in His love has been pointing His light at many people by sending their way the preaching of the saving gospel of our Lord Jesus Christ. But instead of accepting this wonderful gospel of God’s love and receiving the benefit of salvation, many are turning it down and turning against the Light Pointer. There are many people around the world today who get offended at the mere mention of God. The gospel of Christ is clearly an offence to a lot of people; it irritates them and they do not hide their utter contempt and disregard for it. I remember someone telling me some time ago that I was insulting his intelligence because I preached the gospel to him. Are you one of such people? There will be nowhere to run or hide. My friend could run away when he realized his error. Like I said, he screamed in horror and ran as fast as his legs could carry him when he discovered that the one he had insulted was his father. But when we come face to face with God, there will be nowhere to run. Also, he did not know that it was his father that was pointing the light at him. If someone had told him who the light pointer was, he would never had behaved that way – so his misdemeanour in this case is very excusable. But what excuse will those who turn down God’s love have? They cannot say they did not know because faithful preachers of the gospel leave no one in doubt that what they are preaching is God’s message based on His word. Having turned down God’s love on purpose, I wonder what case anyone will have in his/her defence the day he or she stands before God. Yes dear friend, don’t make the mistake of rejecting the light of God’s word and His love for you. Reading this blog is part of God’s effort to reach you with His light. God loves you and He wants you to spend eternity with Him in glory when you leave this world. But for that to happen, your sins need to be forgiven while you are still alive and your soul needs to be saved. God sent us a Saviour in the person of the Lord Jesus Christ who came to this world and died to pay for our sins. Each one of us has to decide whether to accept Him as our Saviour and receive God’s salvation or reject Him and die in our sins. Those who reject God’s love and live as though He is irrelevant will stand before Him face to face one day and you can be sure of one thing – it is not going to be funny. Why not turn your life over to the Lord Jesus Christ today? If you’d like to do so, click here for help.